Note: Post card club newsletter editors may copy all or part of this article for use in any club publication. Lockkeeper requests that you notify ray@lockkeeper.com of any intention to use this article and please, ascribe the article to the original author. Number of words: 382 including captions on illustrations. The name Orcinus Orca comes from Orcus, the Roman god of the underworld. Killer whales are incredibly powerful animals, capable of pushing their entire bodies out of the water. An orca will spend its entire life with the same group and usually becomes attached to its mother. “Orca pods” are similar to a close-knit family group. Orcas have distinctive white patches and are known as ‘fully toothed’ whales. Adults have 50 cone-shaped teeth to chew, and they use all of them! Killer whales have been known to bite a seal in half. They usually travel in packs and not only attack fish, but also larger prey, such as big baleen whales, dolphins, porpoises, turtles, manatees, and penguins. Since orcas have large brains and are very intelligent, they can be easily trained. They can be gentle and are known to cooperated with their trainers. These whales enjoy having their rubbery skin petted by humans, but they do easily become bored and can think up tricks to pass the time. It has been questioned whether the bond formed between orcas and their trainers can replace a whale’s social structure. While in aquariums, orcas can live for about thirteen years. In the wild, they can live for forty to sixty years. Some people think an orca’s lifespan in captivity is much too short. Sea World, Mission Bay, San Diego. Shamu’s gaping jaws are studded with saw-like teeth, each nearly 3½ inches long. 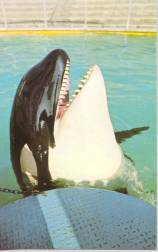 Daily the Sea World trainer thrusts his head between these jagged teeth to inspect the killer whale’s throat. 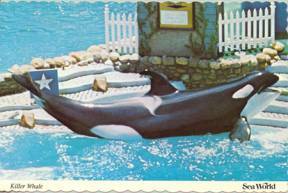 In 9,189 performances Shamu hasn’t gulped once. Shamu . . . the world’s first trained killer whale . . . is a splashy scene-stealer. 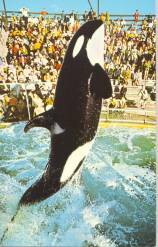 She dominates the Sea World show with her high-jumping silhouette.